Take off your stock teathers! 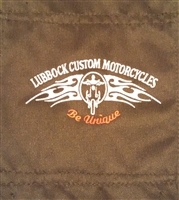 And show off your saddlebags with a pair of our Lubbock Custom teathers. The teathers are NOT screen printed but embroidered with white and red lettering of our original shop logo. Show off some Lubbock Custom pride! As always we apprciate your support!